I am all about convenience, in most aspects of my life. In particular, with cooking. So, when I had an opportunity to try out Blue Apron, I thought I’d give it a go. Really, I wanted to see if Blue Apron was worth the cost. (Note: this is not a sponsored post. A friend passed on a code so I could get a free week of meals, so I took advantage of that). For those of you not familiar with Blue Apron, it is a version of a meal delivery service, except instead of meals delivered fresh, you get fresh ingredients and a recipe so you can cook the meal yourself. I really liked the concept and was eager to check it out. We received ingredients for three different meals in our box, which was well iced so each ingredient stayed cold. Each meal was Mexican themed, in honor of Cinco de Mayo. We had crispy fish tacos, pork and tomatillo pozulle and pulled chicken mole quesadillas. I made both the crispy fish tacos and the pulled chicken mole quesadillas (we are making the pozulle later). The step by step directions were clear and easy to follow but I found that each dinner took me about 45 minutes to prepare (the directions said 35 minutes). I also found it kind of frustrating to have so much prep to do. I think it would’ve helped if I’d had a sous chef in the kitchen, but it was just me. The tacos were okay (I didn’t make the guac since neither of us is crazy about guac) and I really liked the quesadillas. The tacos had an odd batter that tasted good, but didn’t cook well. When I made the quesadillas, I put the cabbage salad in the quesadilla instead of on top and I liked the extra crunch it gave the meal. Blue Apron has two pricing plans: the two person plan and the family plan. The two person plan is 3 meals per week for $60 and the family plan is 2 meals per week for a family of 4 for $70 or 4 meals per week for $140. We tried the two person plan, and that equals out to $20 per meal, which is more than I normally spend on a meal and we also didn’t have any leftover. There was enough food for both K and I to have one serving but that’s it. That’s a bit pricey for me. In addition, you’ll notice that the calorie count is pretty high for one serving at dinner. 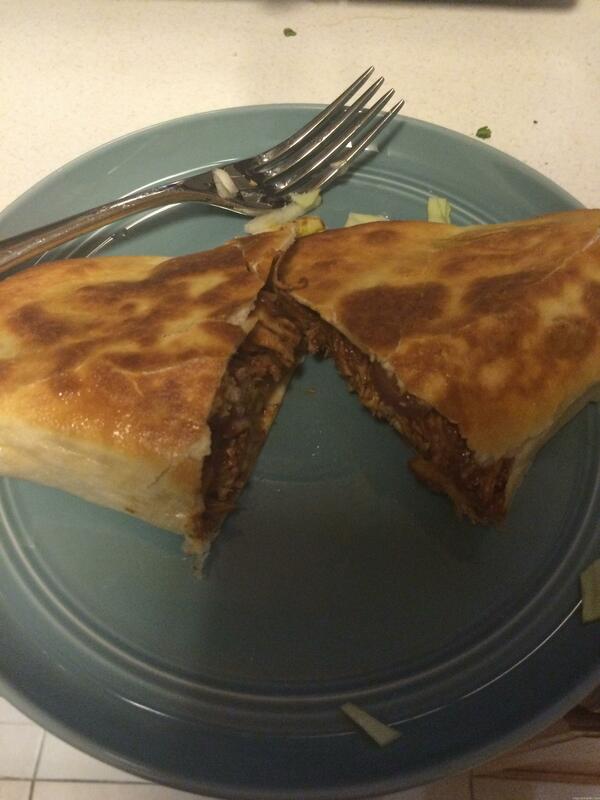 I don’t count calories but 700 calories for essentially one quesadilla just seems unfair to me! All of these things led me to decide to not continue on with Blue Apron. My bottom line: while I enjoyed the meals, the Blue Apron method is just simply not how I cook. I like simple meals with fresh ingredients that don’t take a lot of time or effort (especially during the week). Each meal took me almost 45 minutes, used a lot of ingredients and required a lot of cleanup. That’s just not how I roll on a regular basis. Plus, I’d rather make a big pot of lentil soup or a whole bunch of egg muffins and then have a meal that will serve my family for at least a couple days. 45 minutes for 700 calories and no leftovers just doesn’t jive with me. However, I can see how this can be really helpful for someone who doesn’t have time to get to the grocery store on a regular basis. But since that is not an issue for me (and I actually love going to the grocery store), Blue Apron just doesn’t make sense for us. Have you tried a service like Blue Apron? What did you think? I’ve never even heard of Blue Apron!! I always think these kinds of services would make sense for old single gal me as my time is limited but I think if I just make the effort to carve out time for meal prep, I come out better in the end. Thanks for the review! We’ve tried Blue Apron (same as you, someone shared a coupon). It is convenient for someone to tell you what to server, but SO MUCH CHOPPING! I really prefer Relay Foods for this type of meal planning. I didn’t like that they sent you dishes you might not really enjoy. Like you, I like to do food prep on Sundays, get all my chopping and prepping out of the way, so I can get dinner on the table in 20 minutes or less during the week. Relay helps me do that by allowing me to pick what dishes appeal to us and that I can food prep ahead of time. I have never tried Blue Apron. I think it would be too expensive for a family of four and I like to take leftovers to work for lunch. I do use emeals to help with my meal planning. Every week I get seven dinner recipes. I have to do my own shopping but I don’t mind going to the grocery store. I do like not having to wonder what’s for dinner each night. Yeah, i don’t mind grocery shopping either. The no leftovers was a big sticking point for me, too. Thank you for posting your REAL opinion! I am tried of people pretending they love something because they are paid to do so. So funny you posted this. I received that code too and was intrigued to try it out. I ended up not doing it. I’m glad I didn’t…I don’t think it would’ve been a good fit for my family and budget and time, lol. Thanks for posting this review! I had been curious but it just wasn’t a good fit for us. The food was good but just too much time for a weeknight meal for me! I TRIED to try Blue Apron once. My delivery never showed up. When I called them, they were closed for the day. I called the next day and they said they couldn’t reschedule my delivery for that week and I would have to wait two weeks for another delivery window since the following week was already booked. I had used a “week of free meals” code and they didn’t want to roll it over for me because “these things happen.” I wasn’t about to pay for something that might never get delivered, so I gave up on it. I’m glad to see that, based on your thoughts, I’m not really missing much. I’m so happy to finally see an honest opinion of the company! It’s not available in my area, but I’ve been intrigued with the business idea for a while. I am not a huge fan of cooking in general, but when I do it’s nice to have leftovers to have for a few days. How disappointing you didn’t even get that! Yes it was disappointing to not have leftovers after 45 minutes of cooking! Totally agree on the prep! Maybe it was just the meals I made, but I felt like it took 20 minutes over their estimate. Thank goodness I did it on a weekend… We tried the 4 person option so we’d have leftovers, and the food was good, but I wouldn’t order again. Between SO much prep and not being able to pick the specific meals I wanted, it’s definitely not worth the extra cost. We could get takeout for the same price and choose our options. Yes! I actually thought that the four person would be better suited for a normal couple who wants leftovers. And I agree, for that price, I want what I want not a meal at random! $20 a pop is definitely not cheap. On Friday’s I’ll swing by the yuppie grocery store and I can pick up a premade dinner for 2 (3 courses) for $30. Even that isn’t super cheap, but I don’t have to cook and I like being lazy on Friday evenings. I definitely much prefer being able to throw together dinner in a few minutes and reusing leftovers for a few days. Me too!! I felt like the recipes were just too involved for how I like to cook. I’ve heard of Blue Apron, and appreciate your insight. I think I would rather stop by Wegman’s and pick up their prepped veggies, marinated meats, etc. if I were going to go the prepped food route. oh how i love wegmans! it’s my happy place 🙂 i actually took julie there after we ran the leesburg 20k last summer bc she had never been! i would get a live in maid who would clean daily 🙂 and fold my laundry. oh man would i appreciate that! 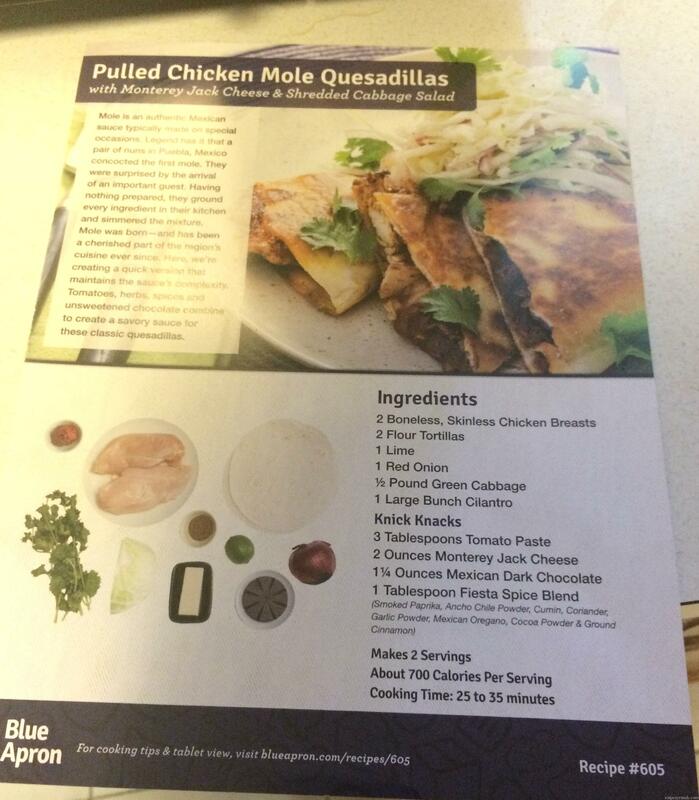 I have a friend who does use Blue Apron and I see her pictures of each meal. I’m a very picky eater so a meal delivery service isn’t for me because of all the food I don’t eat. I can pick out what I want at the grocery store and know I’ll eat it. yes, this is definitely not a good option for picky eaters! Thank you for this honest review! I had thought about getting a Blue Apron delivery or two in the fall after I have my little boy, but I didn’t realize how long it took to make the meals! My goal was to have something quick and easy to throw together when I was sleep deprived and this doesn’t sound like it at all! oh no, it’s definitely not quick nor it is easy! it’s not that it’s hard but there are a number of steps and probably more work than you are looking for! thanks for the honesty! i’ve read tons of glowing reviews of this service by other bloggers, but it’s never quite sounded that great to me. i’m with you – i don’t mind grocery shopping and make time for it every week. thanks for stopping by. i can see how this would work for some, but definitely not for us! thank you for this post!! Everything you mentioned here is why I have not tried it yet. I don’t have time for a 45 min meal that has no leftovers. Thanks for the review! I have seen the boxes in my neighbor’s garbage and was surprised how expensive it is when I checked it out. $20 and 45 minutes for quesadillas? Yeah, that would be too expensive and too much time for me, too. Like you, I prefer simple meals with few ingredients that are quick and easy to prepare. And I also like to have leftovers to take for my lunch. The other problem I’d have with Blue Apron is all the packaging waste from having everything individually wrapped. Yes! This was just the exact opposite of how I cook and so it was not worth it for our family! yeah, it was just a lot of work for me and not worth the price in my opinion! Personally, I don’t think any of these boxes are worth the money, but I’m old school. I buy what I want from the store and that’s that. Plus I do a lot of homemade stuff. hahaha, i hear you wendy!! I, too, used BA first because of a coupon code. I looked thru a few menus and picked the one I found most exciting. For me, that meant working a protein I don’t often work with, or a cuisine I don’t cook on my own. I wouldn’t have picked the quesadillas bc 1) I can make that in my sleep and 2) I KNOW I can make it for far less than $20! Even now, I don’t use it weekly. I look at menus and my schedule and see where BA can fit in. If my husband is complaining about eating the same old stuff, I know it’s time to get BA and find a new recipe for my rotation. That’s the other thing, of the dozens of BA meals I’ve tried, I have incorporated at least a dozen meals into my repertoire. I can usually make the meal for less than $20 if I have all the ingredients, but I wouldn’t buy an entire bottle of vinegar, let’s say, for a recipe I wasn’t sure I’d like. Oh, and while some of the recipes are more labor/prep intensive, I find myself more relaxed doing meal prep when I don’t have to grocery shop beforehand! 700 calories for dinner! I’m really surprised! For some reason I thought Blue Apron meals were healthier than that. I’ve thought about using them, but I have so many food allergies, I figured it wouldn’t be a good choice for me. Yeah I was surprised that each of the meals was around that calorie count! I was actually thinking about joining Blue Apron and I am so glad I read this review first. Thank you for an honest and in depth review! I agree that is a lot of prep time. Personally I enjoy shopping and cooking anyway so I guess the convenience factor is lost on me. The menu sounds good though. I also love grocery shopping! 45 min does seem like a long time to make a meal on a weeknight. I have tried a similar company and found I had to supplement a little. I can see how it could work well for certain people or make a nice gift. I think I prefer to pick out all of my ingredients myself. Yes, I actually love shopping as well! Blue Apron was great as a jumping off point for me to try something new, but with the inability to stipulate my preferences or food issues, it isn’t practical. But for my mom and dad, who don’t have the same issues and also live further out in the country (thus not near groceries), this is a great thing for her to do to get back into cooking and have some fun. I agree – this would work well for a number of people in different circumstances, but it’s just not for us. I love taking the hassel out of things, but this doesn’t sound worth it for our lifestyle. Thanks for sharing! We haven’t done Blue Apron but I have done PLATED which is the same thing. I think it’s worth it if your looking to try new recipes. I order it once in awhile but definiely not worth it weekly!! Oh I’ve never heard of plated! While it looks interesting, and I can understand the concept, $60 for only 3 meals (even for 4 people) seems steep. We can feed our family of 4 for a whole week (that’s at least 2 meals a day for 7 days) for right around $60-$100. So it seems expensive. I’m all about casseroles and soups that can go for multiple meals. Thanks for the review though! Amy @ Running on Faith and Coffee recently posted…Mid Week Bites | Camping Fun! Yes, agreed! I usually cook one or two things they will last multiple meals! Like Mar, I haven’t heard of the blue apron til now! I’m def turned off by the high calorie count! Yeah I was surprised by that! yep, sounds too expensive, and too time consuming for weekday meals. I was frustrated that it took that long to make the meals! Even if I could afford a meal service I wouldn’t sign up for one – I love cooking and grocery shopping! Me too. You still cook with blue apron but you don’t shop, which I enjoy! Interesting. I love to cook so this isn’t an issue but the cost is a major deterrent for me! We have a few nice little local restaurants where we could go out to eat for that price! Yeah agreed! The time factor was a turn off for me, as well! I appreciate your honesty in this post. 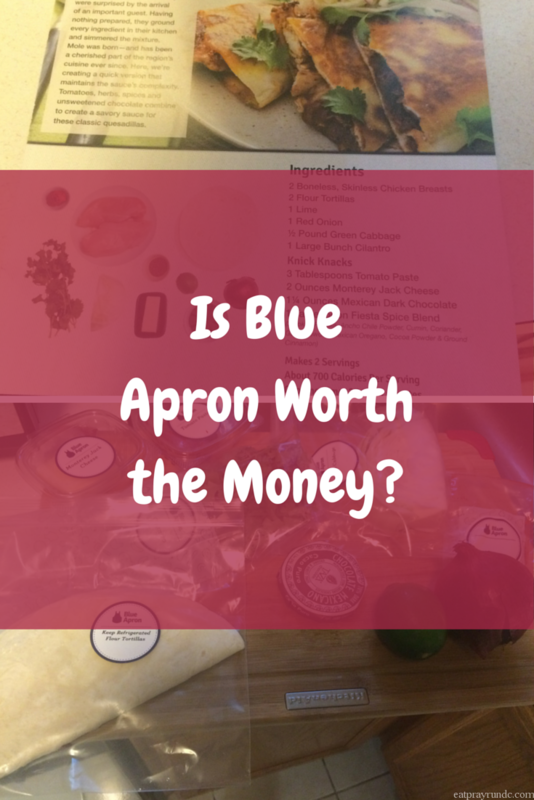 I see a lot of bloggers promoting Blue Apron and I’ve had the a lot of the same thoughts. Yes, it’s convenient, but expensive and looks like a lot of work. I’m glad you posted the calorie counts as well. That is really high for only the quesadilla! Yes!! I’m really shocked — what could be that high cal?? How timely! I was on Twitter yesterday and discussing Blue Apron with another bird, and Blue Apron gave me a discount code. I’m interested to see how it compares with Plated, which I’ve tried two out of the last four weeks. I’m planning to publish a blog post about my Plated experience next week. Interested to see how you like it!! As you can see in these comments some people love it but it was not for us! I am so happy to read a review of Blue Apron. I keep hearing about this. The meals sound right up my alley and I would love getting all of the ingredients. Thanks for your thoughtful review! I’ve been subscribed to Blue Apron for about 10 months now. I only get a box when I like the recipes. Some recipes can be hit or miss when it comes to taste, but when the recipes are good, it’s like a flavor explosion in my mouth. Blue Apron has allowed me to try new foods. For some recipes, I will have leftovers and I can get 3-4 meals out of them. I found that the portion sizes are usually really big. It depends on the recipe, though. The biggest killer I think for everyone I know who’s gotten a Blue Apron box is the long prep time. It is very convenient to get all the ingredients for 3 recipes delivered and not have to plan out my meals for the week. No, I get the 3 meals for 2 people box but I’m only one person. Pasta and soup dishes, for example, are usually the recipes I can get 3-4 meals out of for one person. Ahhhh yes if it was just me I’d have leftovers but not much with the meals we prepared. Soup or pasta makes sense. My box arrived a day late without tracking information this week. I will no longer recommend Blue Apron since this isn’t the first situation I’ve had with them. I’m interested to try another home delivery service, maybe one that has been suggested in the comments here. Wow. I’ve heard a few folks with similar issues. It’s too bad they lost a loyal customer. Let me know if you try another service! I tried Hello Fresh and the 3 recipes in my first box seemed easier than any Blue Apron recipe that I cooked. The portion sizes were about the same as Blue Apron. What I didn’t like is that Hello Fresh doesn’t send out an email when they ship the box and you don’t have a shipping tracking number to know when the box was delivered. I’m going to get another Hello Fresh box and see how that goes. Oh yeah that’s kind of weird? Surely that can’t be the norm?? We use Hello Fresh and love it! I get that it is about $10 a meal, but for our family, it is worth it. Our biggest daily aggravation was always what to cook for dinner. Sure we’d plan but we always were making the same meals every week. I disliked cooking so much! The Hello Fresh boxes are exciting to me. We make it a family event and each pick out a meal we want (3 meals) and all of us work together to cook them. I chop, hubby cooks the meat and our daughter helps with prep. Before it was never like this! I actually enjoy cooking now, have branched out and cooked things I never would have made before (fish, parsnips, etc) and our family time has increased! It’s a win and a fit for our family! That sounds like it works really well for your family! Interesting! I used free code last week two and ended up with two AWESOME meals. I got the 2 meals for a family of 4 and thought they were excellent size and we even had leftovers. The prep was a lot I will agree with you on that, but all of the ingredients I received were fresh. Our meals were awesome. One was a shrimp taco meal and the other empanadas and the kids devoured them. The cost is a bit pricey, but I could see myself doing it if Derek was away flying on a trip, and then only ordering for two. Definitely a splurge! The meals were good (one I loved the other was just okay) but it was the time, price and lack of leftovers that decided it for me. Glad it worked for you guys, though!! thanks for the honest review. I don’t these these types of services exist in France yet… I just cook a ton on the weekends and eat leftovers all week long. 45 minute to cook?! Ummm… I would like a weeks worth of leftovers please 🙂 Thanks for the review. I never got to writing a Home Chef review, but it was pretty much the same experience . I went a little rogue with the recipe and eliminated a couple of ingredients for my porkchops (luckily it was the ClassPass voucher). Yeah exactly! It just wasn’t right for us. Too much time for the amount of food we got. Appreciate your honest review! I just saw an ad for Blue Apron. I think I enjoying the process of shopping and cooking too much to go this route – and I agree, this sounds a bit pricey…and no leftovers?!? Yeah that was a no go for us! I’ve seen a lot of interesting information about Blue Apron this year. I was always very interested in trying it but thought it was too expensive! I recently received a coupon code for Marley Spoon, which is a similar company to Blue Apron. The meals should come next week and I’m looking forward to trying them! Kimberly recently posted…Corporate Crunch Time! Oh I’m interested to hear your thoughts!! Yeah, I tried Hello Fresh and felt similarly. It took a lot of prep time so I didn’t feel like it actually saved me any time. I had to go grocery shopping anyway since I needed groceries for lunches, snacks, etc. And the cost and calories were higher than they would be if I made my own meals. It just didn’t make sense for our lifestyle. Likewise. Not convenient for us! Thanks for sharing. A Friend of mine loves it but I was thinking the same as you…that it would take a lot of time to cook and if I’m paying for a service I’d probably want to receive everything already cooked to save time. Yes, exactly. It works great for some but not for us! I’ve never even heard of Blue Apron. Interesting concept and I think it might work for some people, but I know it would never work for me. I’ve got a family of 5 with 3 of them growing/teen boys. I need to make sure they walk away from the table filled or let the grazing begin. Also, I need to pick the meal because I would hate for them to send me something that my family just wouldn’t eat.